For the design challenge the Hive Fashion Mentors made an assortment of clothes and fabric available for the participants. In teams, participants were given a short challenge to select garments and style to reflect an idea (e.g. “rebellious,” “creative,” “statuesque”). Participants then reflected on fashion as a creative process driven by ideas and practice presenting and articulating those ideas. Participants that completed photo/video consent form then capture their idea in a photography studio-like setting. One person from each design group documented the process via photos and videos, as well as updated a live blog (New York | Chicago). When we broaden the problem space in which youth are challenged to create it enables kids to say “If learning can happen here it can happen anywhere.” When participation barriers are lowered we see rapid fire and increasing sophistication. We’ve found in issuing badges at both events that the contexts increase creative confidence and collaboration. The events were a huge success. Special thanks to the teens from Hive NYC and Hive Chicago, including YMCA and Cooper-Hewitt in NYC and YOUmedia and Street-Level in Chicago, to name a few. Joins us today from 4:30pm – 6:30pm. 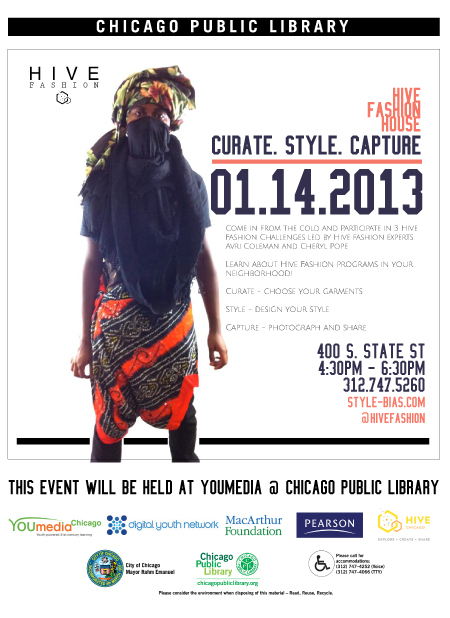 We will be LiveBlogging from the Hive Fashion House event in Chicago. This summer we announced the launch of a new program supported by MacArthur Foundation in which Hive members in both NYC and Chicago would unify around a common theme–fashion–and bring Connected Learning principles to life. The charge is to develop programs and pathways that engage youth in creative production in fashion and multimedia storytelling. 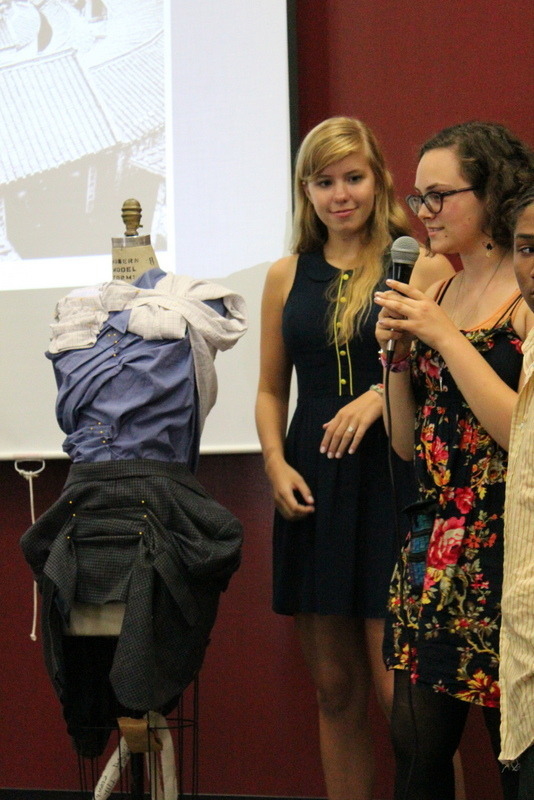 By linking youth interests with peer culture and potential academic and professional trajectories, the two-year Hive Fashion program aims to continue to inform this model of learning via innovative experiences for youth and a rich database of open source curricular resources.Now, we’re happy to announce the first round of Hive Fashion grantees! These projects range from wearable technology and documenting street fashion trends to creating a new teen apparel brand. Each will receive funds towards the development of their project and resources. Re-Fashioning STEAM develops five new fashion-themed challenges for the self-guided FUSE project. Through DEFYNE teens use recycled textiles and materials for their sustainable eco-friendly designs. In addition to these programs that directly result in youth program development, Hive Fashion also awarded separate funds to Special Project Partners to help build collaborations between Hive and fashion/documentary professionals to create opportunities for youth internships, pilot programs, and design challenges. These partners are The Cooper-Hewitt National Design Museum in NYC and YOUmedia in Chicago. Progress on the development of these programs can be found at http://blog.hivefashion.org or by following @HiveFashion on Twitter. For more details please contact info@hivefashion.org. We’re embarking on a new program with Hive Chicago and supported by The MacArthur Foundation, in which we’ll partner with industry professionals to give high school-age teens the transformative learning experience that comes from bringing personally meaningful ideas to life through creative design and production. Hive Fashion marks the first theme-based, cross network approach to program development for Hive Learning Network, and is guided by the principles of Connected Learning. Hive member organizations in both cities will collaborate to design and implement engaging learning experiences that offer youth new skills, digital badges for their achievements, and preparation for future learning and career opportunities. As one case in point, Hive NYC and Hive Chicago joined forces to produce this mini-documentary featuring Christopher Bevans, Design Director for Pharrell Williams’ and Jay-Z’s Billionaire Boys Club streetwear brand, and partner on the development of this Hive Fashion initiative. 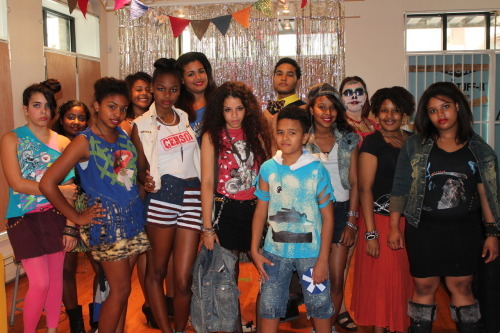 Teens from Hive NYC member Reel Works–a Brooklyn-based program for youth filmmaking and mentorship–filmed, edited, and produced this video, which also featured music tracks created by teens from Chicago Hive member YOUmedia, a teen collaboration space at the Harold Washington Library. 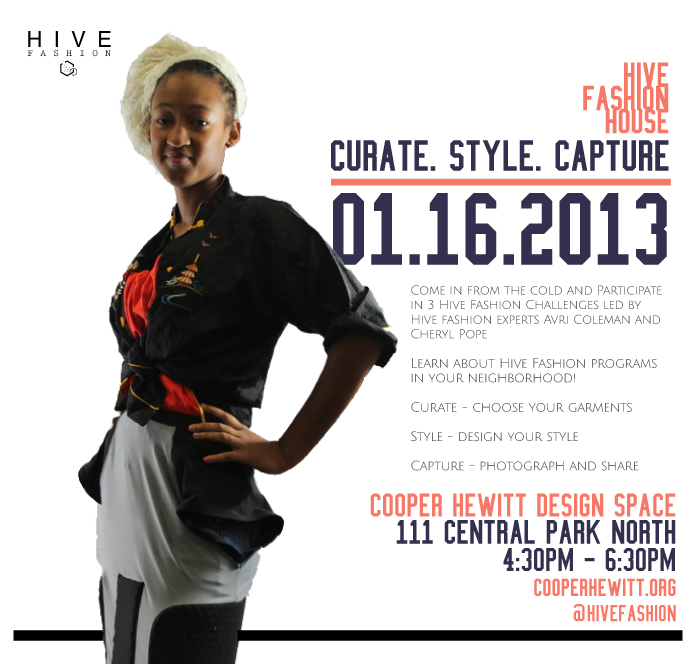 Several existing Hive members have played a key role in the design and development of this program, including Cooper-Hewitt National Design Museum, The New York Public Library and DreamYard in NYC, and YOUMedia, Free Spirit Media, Chicago History Museum and The Chicago Architecture Foundation in Chicago. The following Request for Proposals (RFP) was released yesterday to Hive members, to offer funding to support the development of programs that result in innovative learning experience for youth and a rich database of open source curricular resources. Digital products such as digital explorations of the fashion industry, including video documentaries illustrating career paths or virtual tours of textile factories. A digital badging system to recognize teen growth and achievement. Programs built on Fashion content that is aligned with current research on connected learning. Programs and learning activities that will provide multiple opportunities for testing foundational principles of connected learning. For more information, email us at info@hivefashion.org and follow us on Twitter @HiveFashion. Stay tuned for further details about how this program progresses!